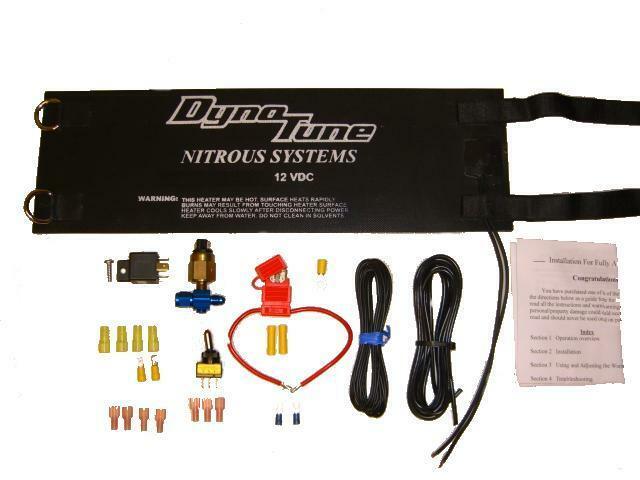 DynoTune Fully Automatic Nitrous bottle warmers Perform!! !This Nitrous Bottle warmer heater is one of the best available and uses the smallest most accurate pressure switch available. Unlike the competition, ours is fully adjustable! 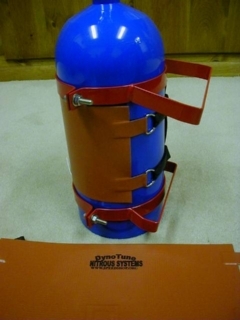 Theirs holds the pressure within 300 PSI, DynoTune's Nitrous bottle warmer heater holds it to 50 PSI. It comes with all the components to install and is made out of superior components! It will work with your existing bottle adaptor. 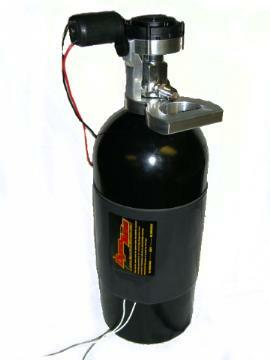 It will keep your bottle at an optimum pressure 900-950 PSI (Fully adjustable from 550-1250PSI). The heater is a full silicone flexible heater with Velcro straps for quick bottle changes. Team this up with the Digital Nitrous pressure Gauge you have the most sofisticated Nitrous Pressure control system Available. Note: Comes with two hole adaptor! The Black high output heaters are now available. The special construction will smoke the competition and you will look great doing it. Get your nitrous bottle warmer heater now before your bottle pressure lets you down.